This old world contemporary townhouse vacation rental is set right in the heart of Scottsdale, AZ. You will have access to all old town Scottsdale has to offer right outside your door! If you are looking to get the true �Scottsdale Experience� look no further. This ground floor Townhouse features two bedrooms and is located on Camelback Rd just one block from Scottsdale Rd. This townhouse make a great Scottsdale furnished rental. Stay a week, a month, or even a year. The condo features all the finer luxuries of home including, granite counter tops in the bathrooms, Brazilian slate stone tile, Solid Knotty Alder wood doors, pebble backsplashes, suede couches, outdoor patio bistro set, stainless steel appliances, original oil paintings, big dcreen TV/DVD, plush mattress, and comfy carpet. The master bedroom includes a platform bed with reading lamp and nightstand, solid wood blinds, as well as a very comfortable reading chair, floor lamp, and six-drawer dresser. This room also has a huge closet complete with hangers and ironing board. The upstairs bathroom has a full shower/Bath, travertine tile, maple vanity, granite countertop, rain head shower, and 100% cotton towels. 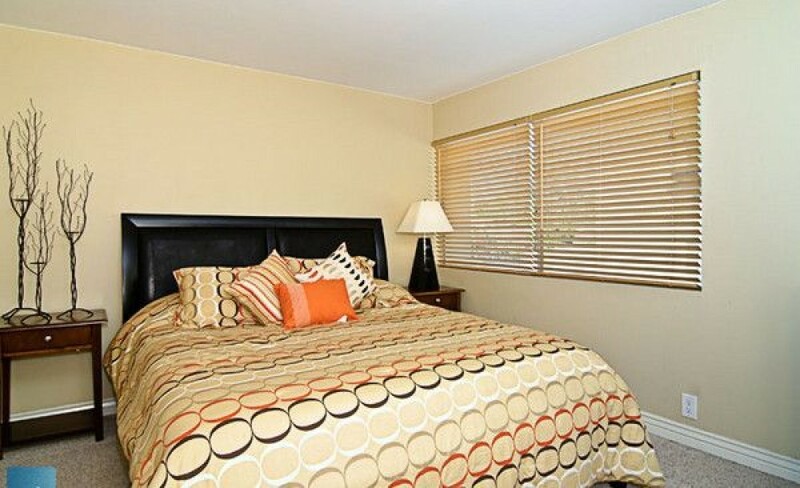 The second bedroom has two twin beds, oil painting, wood blinds, mirrored closet doors, and full-length closet. The downstairs offers a stylish kitchen, dining area, toilet/ wash room and living room area. The back door is just steps away from the pool and laundry room . The community includes two well-lit Shuffle board courts, three heated pools, on-site laundry, one reserved covered parking, and is across the street for the World Famous Fashion Square Mall. Just one block away you will explore various shopping options as you jump from unique boutiques to stores like, Prada, Rolex, BCBG, Boss, Armani, and Gucci. Fashion Squre Mall is one of the top 12 largest malls in the US, and is a block from this townhome.You will also find world class spas, exciting restaurants, night clubs, and art galleries. Within a few minutes drive you can Tee it up at some of the best golf courses Scottsdale has to offer. The famous Phoenician resort is less than 1 mile away!